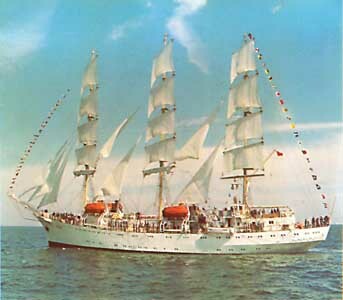 In accordance with STCW - 78/95 requirements (International Convention on Standards of Training, Certification and Watchkeeping for Seafarers, 1978, as amended in 1995, Chapter А - II/1 - Master and Deck Department; А - III - ( 1 - Engine Department, А-IV/2 - Radiocommunication and Radio Personnel), all cadets undergo their shipboard training during the process of education. 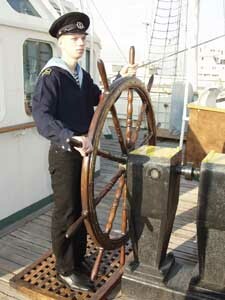 Navigation cadets require minimum of 12 months' seagoing service, other cadets - 8 months. Besides shipboard training, cadets of engineering faculties have technological training at the Academy's workshops and at ship-repairing yards. Junior cadets have their shipboard training on the sailing ship "Druzba".This three mast brig with LOA 108,6 m. and total area of sails equal ling to 3000 sq.m. 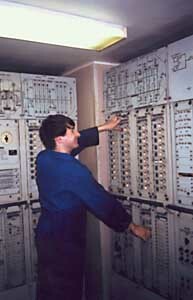 was built in 1987 in Poland. 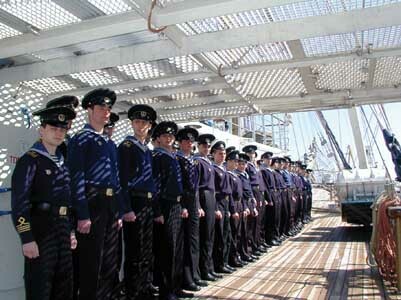 Senior cadets pass their seagoing service on board ships of Ukrainian and foreign companies.